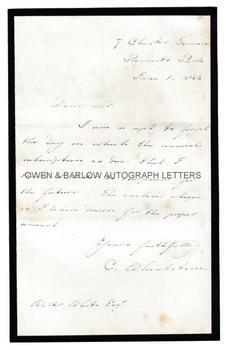 CHARLES WHEATSTONE autograph letter Signed. British (English) scientist and inventor. ALS. 1p. 7 Chester Terrace, Regent's Park. June 1st 1864. To Walter White, Esq. "I am so apt to forget the day on which the annual subscription is due that I think it better to compound for the future. The enclosed cheque is I believe drawn for the proper amount. Yours faithfully, C. Wheatstone." 8vo on mourning edge stationary. Approx 7.25 x 5.5 inches (18.5 x 14 cms). The blank leaf of the bifolium excised to a stub which has previously been used for mounting purposes. Slight mounting traces to verso, else fine. Charles Wheatstone is here writing to Walter White who, for many years was librarian and assistant secretary to the Royal Society. Wheatstone had been a Fellow of the Royal Society since 1836. Charles Wheatstone was a prolific inventor. He is best known as the inventor of the Wheatstone Bridge used to measure electrical resistance, but he was also the inventor of the stereoscope, the English concertina and the Playfair Cipher. Charles Wheatstone also played an important and early role in the development of wireless telegraphy. 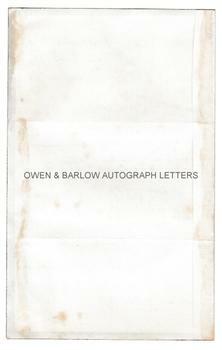 Autograph letters of Charles Wheatstone are very uncommon. Provenance: From the 19th century album compiled by the family of Dr James Copland FRS (1791-1870), the Scottish physician and writer on medicine.